I'm going to paint a picture for you. It's Tuesday afternoon at around 4:00pm. You've been working really hard all day, and you're already thinking about what you're going to make for dinner. But it's 4:00, you still have a few more hours until dinner. Your thoughts are making you hungry. Realllly hungry. You decide to have a cup of tea to curb your hunger thoughts. The tea is lovely but not really doing for you. You need something else. A little bite of something sweet and yummy to take your mind off of dinner. But wait. You've been good all day, you don't want to blow it by having a sweet binge towards the end of the day. What are you to do? 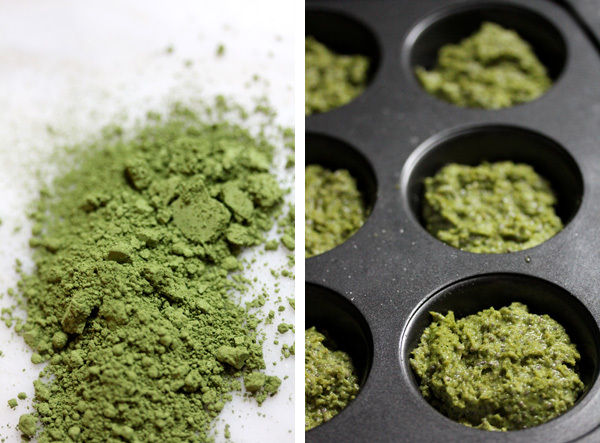 Make some of these vegan green tea cakes. Make them and keep them around for when you want a little mid-afternoon snack. Make them and share them with others who want a mid-day snack. Sure, they're green and weird looking, but don't go being all superficial on me. The fact that they taste good and are good for you will make up for that. It's what's on the inside that counts. The goodness comes from the all-natural non-refined ingredients. Oh, and the green tea. As you probably know, green tea is loaded with healthy antioxidants. If you chose to add the chia seeds to these, you'll be giving yourself a nice little extra added omega-3 for the day. Bonus. Being vegan means they're made without butter or eggs, so I use soy yogurt and soy milk to make these mini cakes moist. Non-processed, evaporated cane juice (a sugar option) to sweeten them up. The perfect sweet, healthy, wholesome mid-afternoon or anytime snack. In a bowl, combine all of the dry ingredients. In a separate bowl, combine all of the wet ingredients. Slowly add the dry mixture to the wet mixture and stir until they are both combined. The mixture will be thick, sticky, and green. In a greased muffin pan, spoon in the batter and leave a little room for it to rise. Optional to sprinkle a little additional sugar and chia seeds on top for a little crunch. Place the pan in the oven and bake for 20-25 minutes or until the tops start to brown slightly.